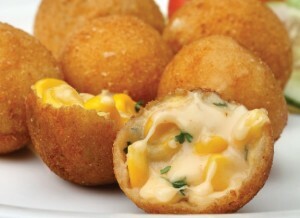 Corn Cheese Balls: Corn Cheese Balls is a wonderful combination of sweet corn and cheese balls. It is a fusion between American Cuisine and Indian Cuisine. The crisp, golden colored appearance of corn cheese balls, which comes out so perfectly thanks to the coating of bread crumbs is so visually appealing and scrumptious to bite into that this item will be wiped off in no time from the table. Add half of the corn kernels & garlic to a food processor and grind to a coarse paste. Melt butter in a pan with high sides on low heat. Add in the all-purpose flour. Stir well till raw smell of the flour goes away. Add in the half & half. Stir continuously and not let the mixture boil. Keep cooking on low flame till you have a thick paste similar to white sauce. Add in the corn mixture, rest of the corn kernel, all the spices, salt, grated cheese, cornstarch and half of the breadcrumbs. The mixture should be thick, tight dough like mixture. If the mixture is too sticky, add more breadcrumbs or cornstarch. Adjust the salt & spices to suit your taste. Chill the mixture in the fridge until you decide to fry them, as you can make the mixture a day ahead of time as well. Take 1 tablespoon measure of the dough and roll into a ball. Stuff each ball with a small cube of cheese. Place the rolled mixture balls on a greased plate. Bring oil to 180°C in a deep fryer. Roll each ball in the breadcrumbs and gently drop them into the oil. Fry them till they are crispy, golden brown in color. Corn cheese balls are ready to be served. Serve hot corn cheese balls with your favorite dips. If you have any queries regarding the Corn Cheese Balls recipe, please leave a comment.